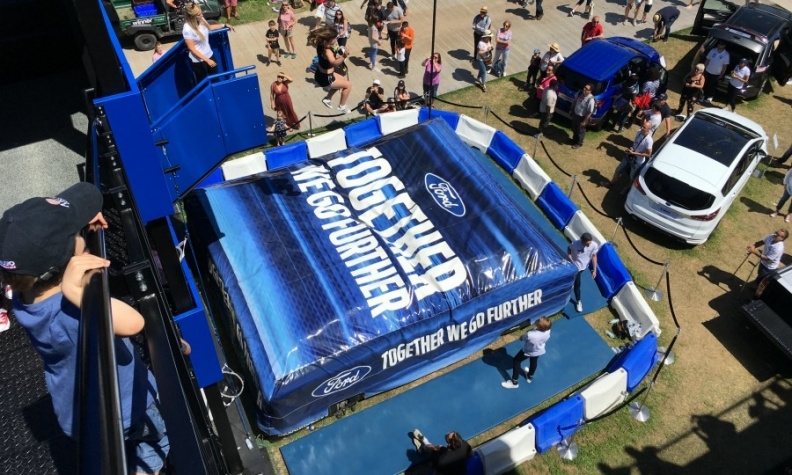 Ford lured show-goers to its stand at the Goodwood Festival of Speed with a giant airbag to leap on to. The relevance of auto shows as a showcase for brands and new model debuts is being questioned as automakers are increasingly holding their own events or choosing to attend smaller, but more diverse, interactive showcases such as the UK's Goodwood Festival of Speed. 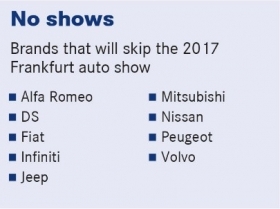 The shift is underlined by the list of brands that will skip next month's Frankfurt auto show (see table below). The absentees will include Peugeot, Fiat and seven other marques that account for 20 percent of all sales in Europe. Automakers are making the change because it's becoming increasingly difficult for their brands to justify the huge amount of money spent to take part in a major auto show when they measure that investment against the perceived effect on sales, said Ian Fletcher, principal analyst for IHS Markit. "I would question what the translation rate is between attendance on public days to transactions -- I bet most customers now are happier to do research online," he said. The static, hands-off nature of auto shows held in convention centers is being challenged by more vibrant outdoor events that provide more entertainment for potential customers. At the Goodwood Festival of Speed, brands set up their stands in a parkland setting and attempt to lure show-goers who are primarily there to see historically significant racecars driven at high speeds by famous drivers. "The manufacturers are very keen to find different ways of showing their products and we've been part of that change," Goodwood Festival of Speed organizer Lord March told Automotive News Europe. The event draws about 200,000 visitors compared with the 931,700 people who attended the 2015 Frankfurt show, but Goodwood's reach on social media is greater, March said. "It's all about the content – manufacturers are pushing out well over 1 million hours of downloaded video. There's lot of noise around what you're doing," he said. He also estimates it costs automakers about three times less to participate at Goodwood than at a big auto show. Renault, for instance, spent less than 1 million pounds to participate at this year's event, a source within the company estimated. Automakers also worry they won't stand out in the frenzy of a traditional auto show. "The challenge is that you've got so many manufacturers with so many messages, it's a violation of the communication rule No. 1, which is: be single-minded," Roelant de Waard, head of sales and marketing at Ford of Europe said. Ford now typically focuses on one message, for example, its Vignale luxury trim line, or performance-oriented cars. The rules are different for shows and regions. For example, Ford's de Waard likes the annual Geneva auto for its restriction on spend, which ensures no one automaker can dominate visually. "It means the message has to be about brand and product," he said. Unlike Frankfurt or Europe's other major show, Paris, Geneva is also on neutral ground where no local automaker dominates. Automakers are increasingly holding their own events. For example, the Jaguar Art of Performance tour held in the U.S. and UK travels the country giving customers the chance to drive new cars. Ford holds Go Further events where it introduces new models to media and dealers. The most recent, held in Cologne, Germany, last year, hosted 2,500 people. In June, Audi brought 2,000 media and dealers to an event complete with an auto show-style display in Barcelona based around the reveal of the A8 flagship sedan. Said an Audi spokesman: "It cuts out the noise of an auto show."